Second post for today....Oh I LOVE this verse on this card! It is such an encouragement to me. Like at this very moment when I'm worn out, and my head is hanging from battling with my seven year old's very strong will all day. I can turn to God and He lifts up my head. 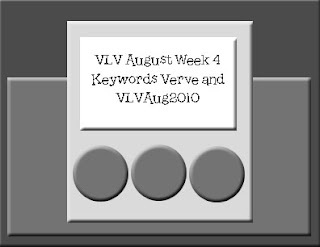 I really love the softness to the pattern, and it totally reminded me of Webster's Pages. 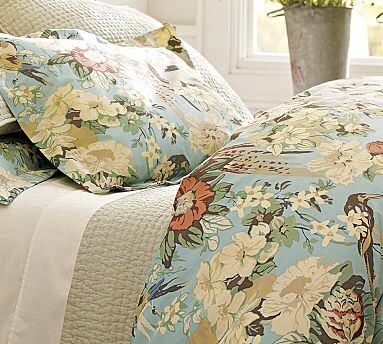 And I really like the quilted look of the comforter and the pillows. I would totally have a bedroom set like this. It looks so peaceful and pretty. So, I've used Websters' Life's Portrait in several sheets for the designer paper, and then to mimic the quilting I ran my Sahara Sand paper through the crimper both ways several times to give it that look. Above is a little closer look at the butterflies that I've added in lieu of the sketch circles....and then I just had to add the extra one too. The Verve set is a Plain Jane Psalm 3:3. Not quite a Shabby Vintage. card ...but sort of in that genre hey? Thanks again for the visit! I'm off to try and demonstrate some more needed patience with this boy of mine. I may have to attach this card to the fridge! 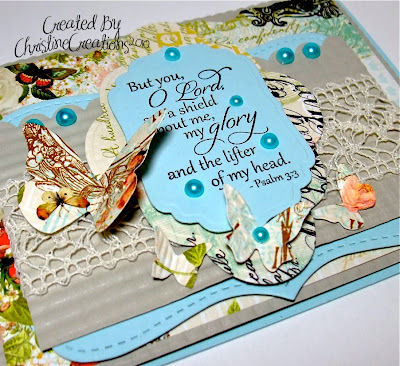 Recipe: Stamps: Verve - Plain Jane Psalm 3:3; Ink: Memento Tuxedo Black; Paper: Soft Sky, Sahara Sand, Websters Pages - Life's Portrait; Accessories: Big Shot, Labels 4, Labels 8, Top Note Die, Scallop Edge Punch, Crimper, Butterfly Embosslit, Pearls, Dimensionals, Crochet Ribbon. This is so beautiful... Love all of the details, the colors, the layout. Perfection, my friend! Soooo beautiful Christine...wow your take on the sketch is perfect and so is your take on the inspiration piece..just beautiful girl! This is gorgeous, Christine! Love the colors and lace. Wonderful layout. This is gorgeous Christine!! I so love your inspiration and the dp you matched to it. YOur design is so elegant. 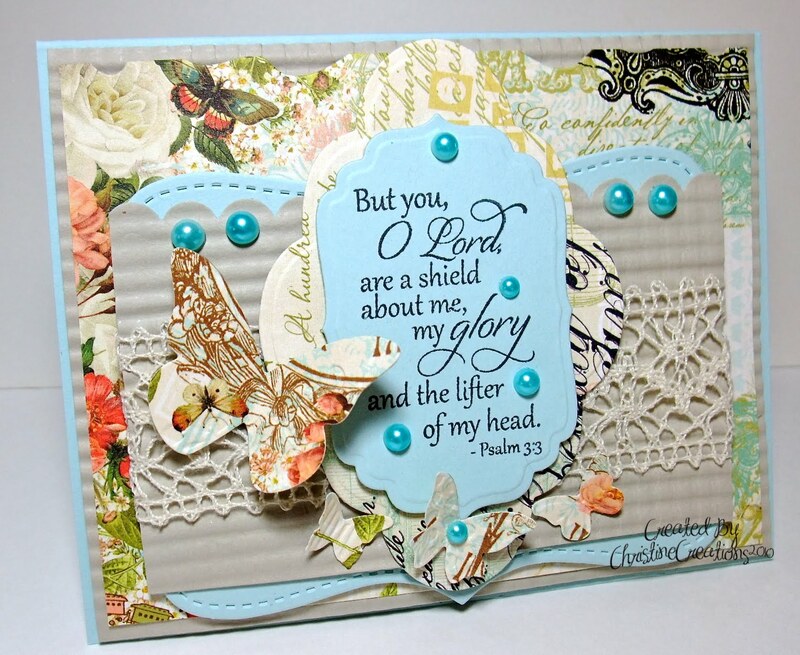 Love your lace, butterfly and sentiment. Perfect use of the sketch. Christine this is just stunning!!! The way you've showcased this verse, the colours and all the detailing is just gorgeous!!! WOW! Quite stunning Christine! 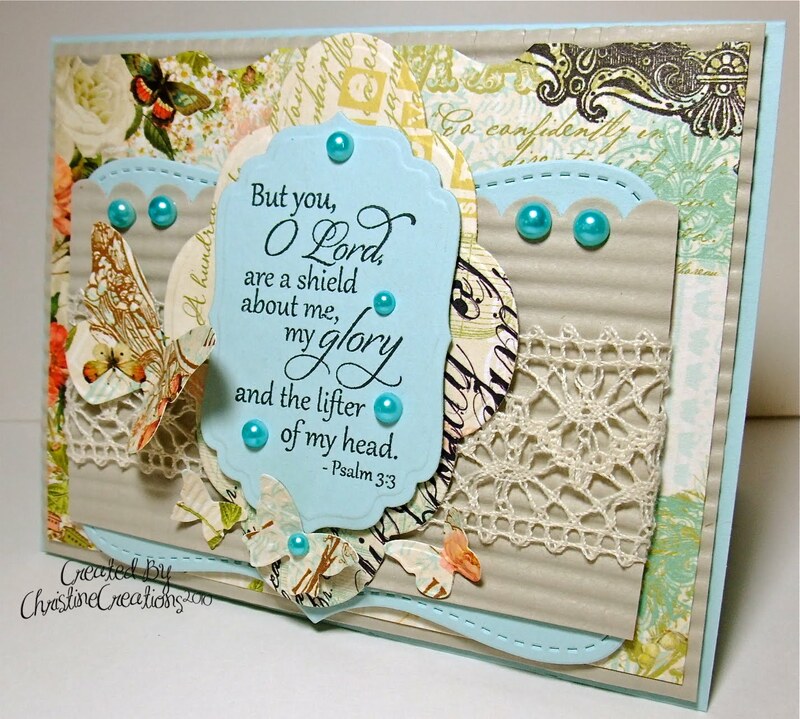 This beauty will bring encouragement to someone! This is just gorgeous, Christine...and I love the verse!! I love the papers and beautiful lacy trim also!! I love this! It is such a beautiful reflection of the inspiration piece, which I also love! The layers, the papers, the texture with the lace and crimping, it is just lovely!